Clustered Regularly Interspaced Short Palindromic Repeats (CRISPR) contribute to a bacterial system for defence against infection from phages, similar to acquired immunity in eukaryotes. Key components of CRISPR have been adapted for use as a tool for genome engineering in a variety of organisms. The editing system consists of two components: CRISPR-associated endonuclease 9 (Cas9) and a guide RNA (gRNA). Cas9 protein creates a double strand DNA break at a site in the genome that is defined by the sequence of a gRNA molecule that is bound to the Cas9 protein. The location at which the Cas9 protein cuts the DNA is defined by the unique sequence of the RNA that is bound to it. The gRNA consists of two sections, a scaffold region required for the RNA to bind to Cas9 and a 20 nucleotide targeting-sequence, which directs Cas9 to the desired cut position in the genome. First, a DNA molecule is introduced into a cell that encodes the Cas9 protein and also encodes an RNA molecule that has both the scaffold sequence and a sequence that will bind to location on the genome to be cut. Following transcription and translation the Cas9 protein binds to the scaffold section of the gRNA. This forms a gRNA-Cas9 complex causing a conformational change in the Cas9 protein enabling the RNA-protein complex to bind to double stranded DNA at loci defined by the guide RNA. This guide must contain the sequence NGG, the Protospacer Adjacent Motif (PAM) at the 3' end (see figure 1 'PAM' section). It is important to note that the NGG PAM sequence is not in the guide RNA molecule, but must be in the genome to allow cleavage. 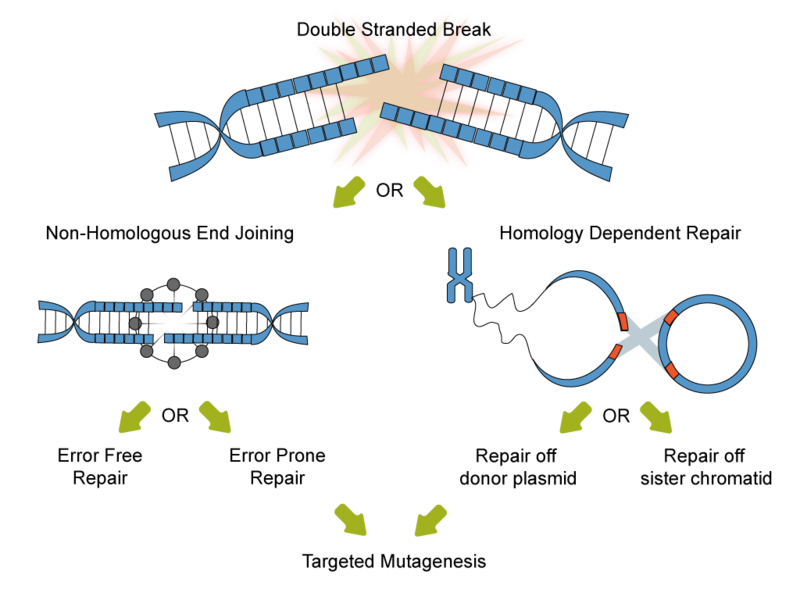 Whether the PAM bound-Cas9 cleaves the DNA strands depends on base pairing between one of the genomic DNA strands and the targeting region of the gRNA (figure 1). Base pairing begins at the 3’ end of the gRNA targeting region and propagates along towards the 5’ terminus. A 100% match will lead to efficient cleavage, however, Cas9 tolerates up to 7 mismatches toward the 5’ end of the gRNA. There must be no mismatches in the 11 base pairs (bp) preceding the PAM site (Cong et al., 2013). This is an important factor when considering potential off-target binding sites. Online tools are available to help minimise off-target binding (please see below). For more information on CRISPR experimental design please see the following review (Graham & Root, 2015). Figure 1: Diagram of the genomic DNA, gRNA and Cas9 complex. The NGG PAM site is not present in the gRNA but must be present in the genomic target sequence. The Cas9-gRNA riboprotein complex binds the genomic DNA and base pairing between the targeting-region and complementary strand leads to cleavage of the genomic DNA. A less efficient but more accurate pathway called homology directed repair (HDR), which requires an intact DNA repair template. Figure 2: Diagram of cellular pathways for double stranded break repair and their use for targeted mutagenesis. If the double strand break is repaired by NHEJ, this often results in short insertions or deletions (indels) at the cleavage site. This is the mode of repair used if no homologous repair template is provided. NHEJ creates short insertions or deletions where the break occurred. If the cleavage site is within a coding region, and if that mutation causes a frame-shift, it will effectively disrupt / silence that gene at the genomic level. 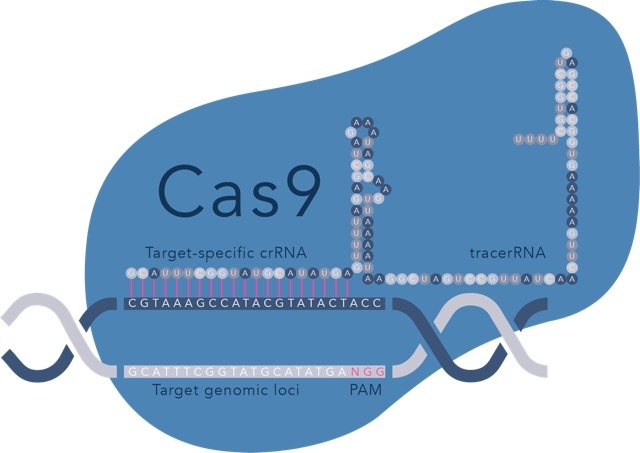 The CRISPR system can be used to disrupt genes and generate knock-outs cells by co-expressing a gRNA specific to the target gene with Cas9 (see figure 1). The target sequence must be immediately upstream a Protospacer Adjacent Motif (PAM). The sequence of the PAM site is NGG. The target sequence must be immediately upstream a PAM (NGG) site. At Oxford Genetics we offer vectors containing cassettes for expressing Cas9 plus a gRNA of choice. These may be in the same vector, which simplifies experimental set up and improves co-transfection efficiency; or in separate vectors, which allows more control over the relative dosage of Cas9 versus gRNA. We also offer an adapter to allow expression of two different gRNAs from the same vector. This may be useful, for instance, for disrupting two genes simultaneously or making large deletions. We offer Cas9 expression vectors with a variety of different promoters to tailor Cas9 expression to the desired cell-type and/or required expression level. We offer a range of expression vectors where Cas9 is co-expressed with a marker gene (either GFP or puromycin resistance) by means of an internal ribosome entry site (IRES). 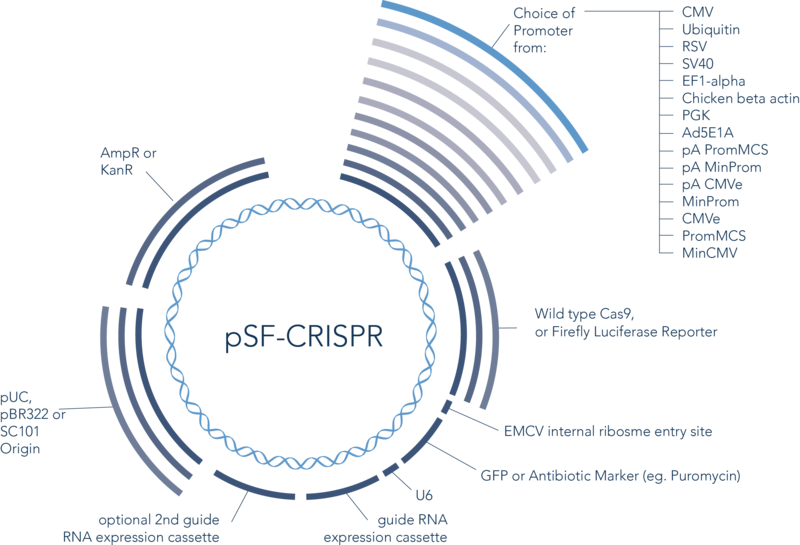 Figure 3: This image show some of the more popular sequences and plasmid variants from our CRISPR plasmid platform. Our plasmid collection includes over 2000 unique sequences of functional components (peptide tags, reporter genes, selection genes). These can all be inserted into our CRISPR plasmids through our custom cloning services. Contact our team for more information. Cong, L., Ran, F. A., Cox, D., Lin, S., Barretto, R., Habib, N., … Zhang, F. (2013). Multiplex genome engineering using CRISPR/Cas systems. Science (New York, N.Y.), 339(6121), 819–23. Graham, D. B., & Root, D. E. (2015). Resources for the design of CRISPR gene editing experiments. Genome Biology, 16(1), 260.